Item # 314648 Stash Points: 5,495 (?) This is the number of points you get in The Zumiez Stash for purchasing this item. Stash points are redeemable for exclusive rewards only available to Zumiez Stash members. To redeem your points check out the rewards catalog on thestash.zumiez.com. Get a lightweight and durable vert-slayer, with the Baker T-Funk Bad Decision 8.5" Skateboard Deck. Featuring large, long and wide kick tails for maximum pop, this board is extremely lively, even in it's larger size. Offering moderate concave and wheel wells for excellent flip-tricks and grip, this deck is ready to ride everything from the local half pipe, to the hand-rail you've been eyeing down the street. 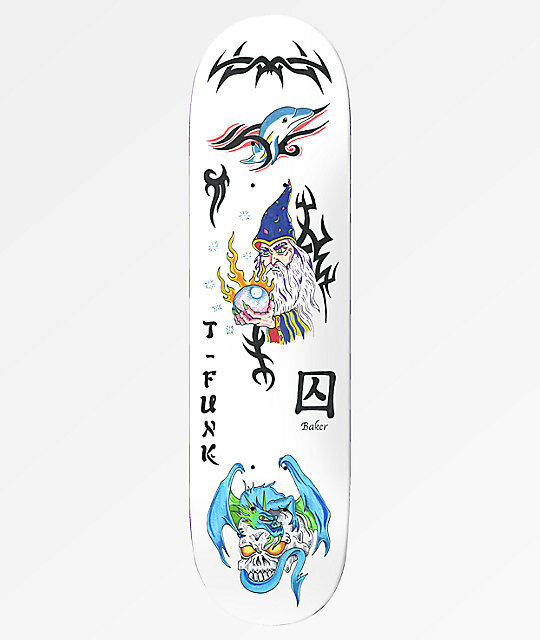 T-Funk Bad Decision 8.5" Skateboard Deck from Baker Skateboards. Signature Tristan Funkhouser pro model. Medium concave, small wheel wells. Not: Components such as trucks, wheels, and bearings sold separately.